Home Curiosities Madrid Gastronomy tours and Food Truck? 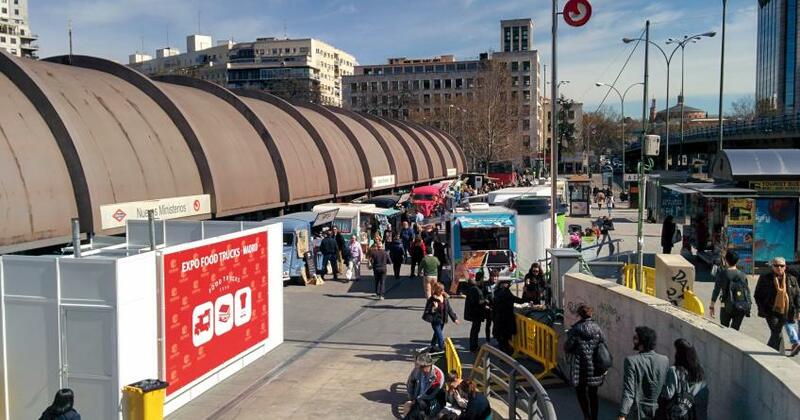 If you have recently been in any event in Madrid for sure you have seen a food truck. If you have never eaten from a food truck you have missed out on something fun and special. Food trucks are a culinary tendency that has come up in the last two decades and Madrid has adopted them quite nicely and have become part of Madrid Gastronomy tours. It can pop up just about anywhere, near train stations, shopping malls, marketing events etc… The food part of it is the surprise effect of saying, “hey look, a food truck, let’s have a bite to eat.” We highly recommend indulging on food trucks as a part of Madrid Gastronomy tours, because some of our food trucks in Madrid offer traditional Madrid tapas style foods. However the food truck phenomena is not something new, this service dates back even to the 19th century, with the transformation of big cities, an improved industrialization of food and the need to have a quick bite to eat. In places like Japan, sushi was sold on carts, in New York City, some bigger carts were pushed around during lunch peak hours with their infamous hot-dogs, probably the precursors of food trucks today, and in Madrid we like to refer to them as a moving Madrid Gastronomy tour service. Madrid Expo Food Trucks is an example of the evolution of Madrid food, where, besides a great variety of food, there is a neat congregation of restored historical vehicles serving food, a great add on to the Madrid Gastronomy tour concept. Due to the cold winter weather, there are no dates established yet, but this is there webpage is want to check up on any future dates. At Native Spanish Tapas we enjoy a great variety of Madrid food in each and every tour that we offer. We like to nose around all the new tendencies alongside the evolution of Madrid gastronomy and Madrid food trucks is just one of the latest. Join us on one of our many unforgettable Madrid tapas tours.